Barely visible against the snow covered landcape near the Hudson Bay in Churchill, Manitoba, a Willow Ptarmigan forages on the frozen tundra during the winter. The Willow Ptarmigan has a plumage which changes to pure white in the winter creating the perfect camouflage for this bird while wandering across the frozen tundra near the Hudson Bay in Churchill, Manitoba. During the summer months, the plumage on the Willow Ptarmigan is a reddish brown and white color which blends in with the changing tundra hues. Predators have a hard time seeing the Willow Ptarmigan during the winter and when the bird finds it necessary to hide, especially when trying to sleep, it will fly directly into a snow bank. There will be no tracks left behind which keeps it safe from any hungry predators trekking across the winter tundra. Foraging during the cold months is fairly difficult for the Willow Ptarmigan, but as spring arrives, feeding because an easier task. The male Ptarmigan will grow to be about 43 centimeters in length and weigh about .56 of a kilogram, approximately the same size as a chicken. 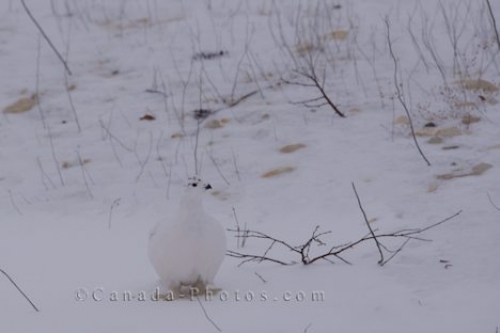 Picture of a Willow Ptarmigan on the snowy tundra during the winter along the shores of the Hudson Bay in Churchill, Manitoba. If the Willow Ptarmigan did not have black eyes and a black beak, it would be almost impossible to see this bird during winter, even those can be mistaken for rocks or branches if the bird remains still. Willow Ptarmigan, Lagopus lagopus, foraging in the tundra near Hudson Bay, Churchill, Manitoba, Canada.